Local Labour party members have chosen 3 experienced community campaigners to represent Labour in Stockwell at the next council elections. Councillors Pete Bowyer and Imogen Walker will be restanding for Labour, and they will be joined by local resident Alex Bigham, after Cllr Akhtar decided to stand down at the next election. 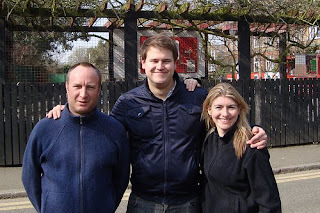 All three are pictured here near the Oasis play centre in Stockwell. Pete Bowyer has represented Stockwell residents since winning a by-election in 2003, when the Lib Dem councillor was forced to resign after being found guilty of criminal charges. Since then, Pete helped establish a drinking ban around the tube station, secured a grant for the Dorset Road Community Centre and is fighting for a better concierge service for residents. Imogen Walker has been your Stockwell Labour councillor since 2006, and lives just off Lansdowne Way. She has helped secure funding for a half million pound community centre for Portuguese residents, has worked with police to get more visible patrols across the area and secured extra funding for youth services at the Oasis centre. Alex Bigham has lived in Stockwell for over 7 years, and his family for nearly 3 decades. He is a board member of a local housing association. He would like to see the Stockwell war memorial cleaned up and restored to its former glory, and is campaigning for a new bus route to run through Stockwell. Innit a pretty piccy of the triple div's? Ah me heart is blowing bubbles of joy. They could use the pic for a "Packet of Three" OXO Ad'.